The distance between Kenting & Hualien is about 300 KM. It is also one the remote areas in Taiwan so that there are fewer public transportation choices. Here are some transportation alternatives and provide some itinerary examples for you to follow. For most foreigner visitors who travel between Kenting & Hualien, the transportation is much difficult to arrange. The distance is almost 300 KM and you need to transfer if you take public transportation, It is remote area, comparing to other areas, and the train frequency is low. Here is some transportation information that may make your itinerary more smoother. The service started from March, 2015. This is the most convenient transportation since you don't need to transfer at Fangliao. You can also aboard from Taitung. 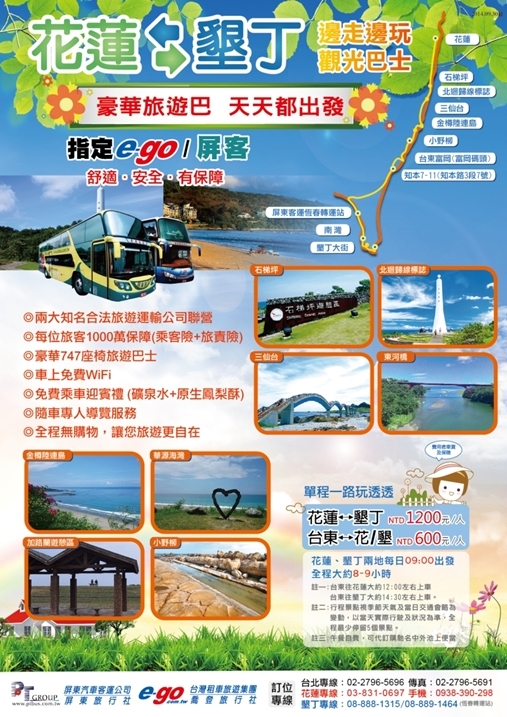 Every morning there is a tour bus launches from Hualien / Kenting toward Kenting / Hualien. The trip takes about 8~9 hours and costs NTD 1,200 for each passenger. 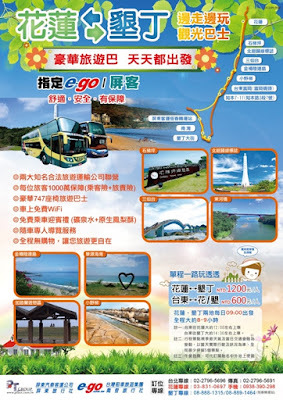 The tour bus also stops at some attractions along the east coast and arrives Kenting / Hualien around evening. Different from by bus/train transfer, which is introduced in next section, the route of tour bus is along east coast line (HWY 11), and railway is along the East Rift Valley (HWY 9). If you are tired of transfer, the tour bus would be a better choice. In additional to fare, timetable and etc, the major difference is the view. The route of the tour bus is along the 150KM endless east coast and the train is along the East Rift Valley, which will become a golden rice field in July and October. Since the tour bus will take a rest at some attractions, it take 8~9 hours to finish to 300 KM trip. However, if you have booked the fastest train, you can arrive within 6 hours. The following table are itinerary examples. Be noted that the timetable of train and bus may change, Please confirm in advance. You can take 9117、9188、9189 between Fangliao & Kenting. It takes about 1 hour. The first bus is 9117, which departs Kenting toward Fangliao and Kaohsiung at 4 am. The last bus departs at 23:20. The bus service is almost 24h. If you want to catch the train to Taitung/Hualien, please arrive Fanliao train station at least 20 minutes in advance. For information about booking, payment and collection train ticket, please refer to Booking Train Ticket. Since Taitung Station is the most important station along the way and most passengers alight here, no matter from Fangliao to Hualien or from Hualien to Fangliao, you can buy 2 tickets (Fangliao<->Taitung, Taitung<->Hualien) for the same train if you can not book reserved tickets for Fanliao<->Taitung. If you have a few hours, you can stopover at Chishang. Renting a bike and riding in the rice field is enjoyable. Th best time to visit is Jun & Oct, the time the rice is ripe and the filed become golden puzzle. January is another best month to visit Chishang, it is the month of rapeseed flower. 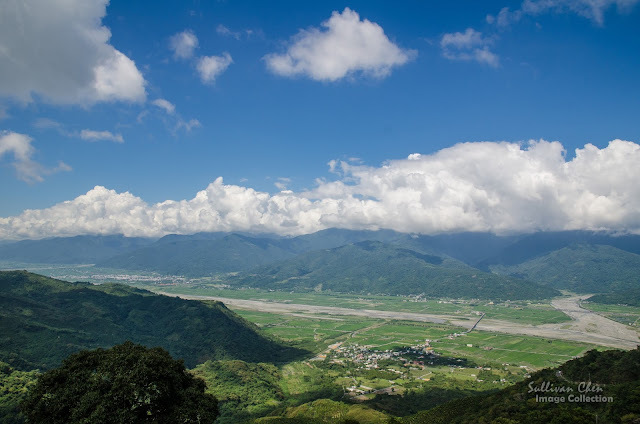 Taitung is a transportation center of southeast Taiwan. It is the terminal stations of lots trains. Therefore, only about 5 trains between Fangliao and Hualien everyday. But if you transfer at Taitung, There would be more choices. For example, you can take Tze-Chaing 371 from Fangliao to Taitung and then take Tze-Chiang 421 to Hualien. You can know more about how to booking train ticket from Booking Train Tickets. Fangliao is a tier 3 station. Not many express trains stop here. However, 10 express trains every day is flexible for you to arrange your itinerary. There are more choice between Taitung & Hualien since Taitung is a tier 1 station and and Hualien is a supreme station. The tickets between Hualien & Taitung are easy to book. If you have enough time, you can stop at some attractions including Chishang, Guanshan. You can use the same to exit the train station and come back to take another train to your destiny station. Although you don't have a reserved seat, you can easy to find a seat available.